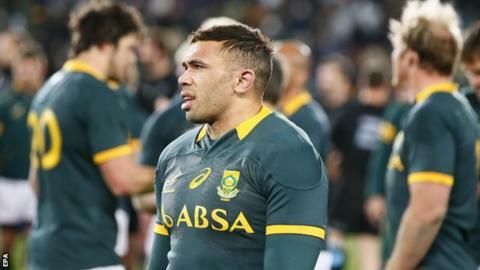 South Africa coach Heyneke Meyer says his team is behind him, despite accusations he is not picking enough black players. Prop Tendai Mtawarira was the only black player to start against the Pumas in Durban, with wing Bryan Habana - who is mixed race - also in the team. Four non-white players are in the starting line-up for Saturday's return match in Buenos Aires - Habana, Lwazi Mvovo, Trevor Nyakane and Zane Kirchner. South African Rugby Union has a 'Strategic Transformation Plan' that is designed to "raise black representation", with the intention of having non-whites making up half of all domestic and national teams by 2019. Media reports suggested five black players approached the Congress of South African Trade Unions with grievances over their non-selection for recent matches, resulting in calls from the organisation for Meyer to be sacked over what they termed "racist choices". "I'm totally committed to transformation and I have a great relationship with my players," said Meyer, whose team have lost four Tests in a row. "A lot of them came to me and said: 'Coach, it's not true what's in the papers. We stand by you, we know exactly where we stand.'" De Villiers, who coached South Africa from 2008 to 2011, said Meyer had "underestimated the intelligence of black people with a dishonest selection". In a strongly worded article in South Africa's The Times, he said the selection of white centre Jesse Kriel at the expense of players such as Lionel Mapoe and Juan de Jongh was a "decision [that] took the country back to the late '80s, when blacks supported the opposing teams because of apartheid". South Africa will include seven non-white players in their 23-man matchday squads for next month's World Cup, with at least two of the seven being black Africans. That selection criteria forms part of the SARU transformation plan.